Anupriya is a Management Professional with 7+ years of experience in Academics and Corporate. She has completed her graduation in Electrical Engineering from IP University, New Delhi. She started her career with academics as a Lecturer (Electrical Engineering). She is also certified in ‘Lean Six Sigma Green Belt’, ISO 9001:2008, HR Analytics by SHRM. She went on to pursue her Post Graduation in Management with specialization in HR and Operations Management. Thereafter she joined an Industry Body of Indian Power Sector PSUs. Here she worked on various projects in areas of Business Excellence (EFQM Model) for power stations. She did the HR Analytics, Competency Mapping, Training and Development, Manpower Planning, Employee Engagement, Pay Revision for Indian Power Sector PSUs. Anupriya has also conducted various studies in member organizations and published them in form of Compendiums, namely, Employee Surveys, Training Policies, CSR, Competency Mapping, MoUs. 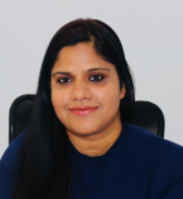 She has developed and designed the handbook for Superannuating Employees for one of the Indian Power Sector PSU and wrote a white paper on Return on Training Investment (ROTI). Anupriya has also managed quarterly journal named ‘PowerPeople’, specifically for HR Executives of member organizations. At ThreeFish Consulting, Anupriya is responsible for managing the projects, client servicing and associated research & analysis work.